SNK Playmore is once again in the hardware business. The Osaka-based game company is licensing a new (well, sort of) portable Neo-Geo gaming system. This is it. The handheld sports a 4.3 inch LCD screen, 2GB of onboard memory, and an SD card slot. There are twenty pre-loaded games, all of them old Neo-Geo classics. The games, which can be played in English, are World Heroes, Ultimate 11, Top Player's Golf, Sengoku, Nam-1975, Mutation Nation, Last Resort, King of Monsters, Frenzy, Cyber-Lip, Fatal Furty Special, The Art of Fighting, Super Sidekicks, League Bowling, Metal Slug, Magical Lord, Baseball Stars Professional, Samurai Shodown, The King of Fighters '94, and Fatal Fury. The device is larger than an iPhone or your typical smartphone. The back reads "SNK", while the top has an AV Out slot, L1/L2 buttons, and R1/R2 buttons. The front reads "SNK" and "Neo-Geo". There is a "Menu" button and a "Start" button. The face buttons are A, B, C, and D.
The side of the portable has a power switch and, as previously mentioned, an SD Card slot. Considering that this reveal came via a Japanese game blog and not from SNK itself, this does look to be a leak, and it could even be a prototype. 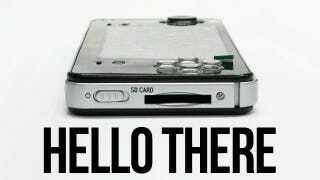 According to the blog, the temporary name for the device is "Neo-Geo Keitai" or "Neo-Geo Portable". Note that once it goes in to production the device's specs could change. The Neo-Geo was original a cartridge-based arcade and home console system SNK manufactured in the 1990s. The last console SNK created was the Neo-Geo Pocket, released in 1999. SNK ceased production in 2001. Kotaku is following up with SNK and will update this post should the company comment.